Convex hulls in N dimensions. Additional options to pass to Qhull. See Qhull manual for details. (Default: “Qx” for ndim > 4 and “” otherwise) Option “Qt” is always enabled. The convex hull is computed using the Qhull library. vertices (ndarray of ints, shape (nvertices,)) Indices of points forming the vertices of the convex hull. For 2-D convex hulls, the vertices are in counterclockwise order. For other dimensions, they are in input order. simplices (ndarray of ints, shape (nfacet, ndim)) Indices of points forming the simplical facets of the convex hull. neighbors (ndarray of ints, shape (nfacet, ndim)) Indices of neighbor facets for each facet. The kth neighbor is opposite to the kth vertex. -1 denotes no neighbor. equations (ndarray of double, shape (nfacet, ndim+1)) [normal, offset] forming the hyperplane equation of the facet (see Qhull documentation for more). coplanar (ndarray of int, shape (ncoplanar, 3)) Indices of coplanar points and the corresponding indices of the nearest facets and nearest vertex indices. 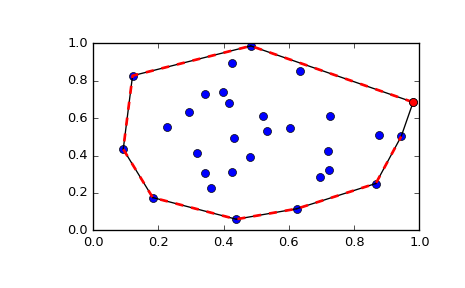 Coplanar points are input points which were not included in the triangulation due to numerical precision issues. If option “Qc” is not specified, this list is not computed.